By NNA Staff on December 01, 2009 - When relying on a credible identifying witness, you should administer an oath or affirmation. Here is some recommended wording. By NNA Staff on December 01, 2009 - Notarial wording often lists a signer's title. This designation is called the signer's "representative capacity," and notarizations with this designation need to be handled with care. By NNA Staff on December 01, 2009 - Imposture is when a dishonest person obtains a genuine identification document from a state or federal issuing agency by posing as another person and falsely submitting the other person's name. 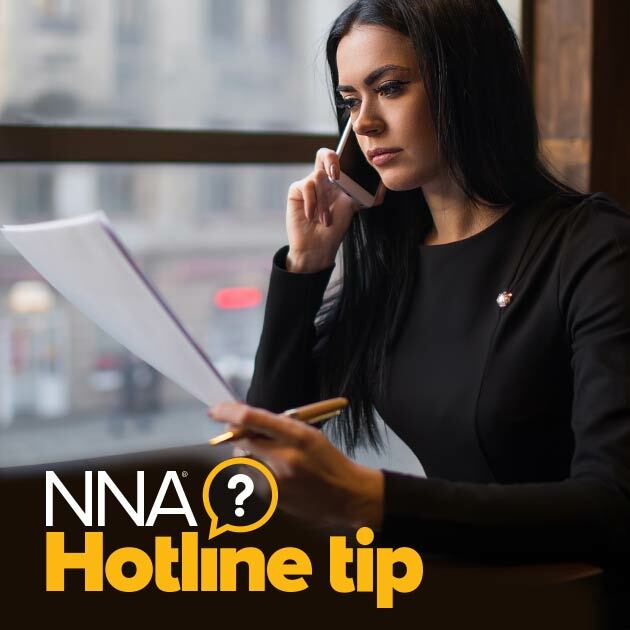 By NNA Staff on November 02, 2009 - A common misconception about Notaries is that they are always required to witness a client signing the document in the Notary's presence. By NNA Staff on October 01, 2009 - Tips on using a subscribing witness during a signing. By NNA Staff on October 01, 2009 - You’re at the final stages of a notarization. Everything’s gone smoothly until you stamp the document, and the seal is unreadable. What do you do? Hotline Tip: What Is A Loose Certificate? By NNA Staff on October 01, 2009 - A loose certificate is a notarial certificate that is contained on a separate sheet of paper and is not part of the original document. By NNA Staff on August 18, 2009 - Tips on how to properly fingerprint your signer. By NNA Staff on August 18, 2009 - How enterprising Notaries use such sites to promote their business and find new customers. By NNA Staff on August 17, 2009 - Notaries often are asked to certify that certain events or actions have occurred, but this is not the usual notarial act. What do you do?